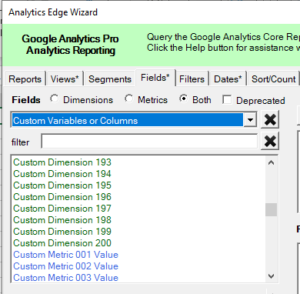 The Google Analytics Pro connector from Analytics Edge supports the extra dimensions and metrics available to Google Analytics 360 customers. It also supports the new resource quotas, allowing GA 360 customers to get unsampled reports up to 100 million sessions! The connector automatically detects the account type and adjusts the available metrics and dimensions list accordingly. The new setting is available on the Options tab.